Aria Hall of Hampton University holds the Female Student of the Year and Best Student Organization Awards for 2017 at the July event. Remember when Warren Beatty and Faye Dunaway mistakenly gave the Oscar for Best Picture to La La Land instead of Moonlight? Fortunately, nothing like that happened at the 2017 HBCU Awards, which acknowledge the positive impact of HBCUs on American culture. For the past six years, HBCU Digest has hosted an awards ceremony highlighting historically black colleges and universities and their students. One of the biggest awards, the equivalent of Best Picture at the Oscars, is HBCU of the Year. There are 27 others, from Best Marching Band to Best Female Athlete. Students and institutions can be nominated for an award by anyone. This year’s awards ceremony was presented by the Thurgood Marshall College Fund and took place in Washington, D.C. Winners were selected by a group of HBCU alumni, presidents, students, faculty and reporters who regularly cover HBCUs. Hampton University student Aria Hill received awards for Best Student Organization and Female Student of the Year. Hill, 21, is a fourth-year student in Hampton’s six-year pharmacy program. In 2020, she expects to graduate with a doctorate degree in pharmacy. “It was an easy choice for the selection committee,” said Jarrett Carter Sr., founding editor of HBCU Digest and a 2003 graduate of Morgan State University. Hill, who also was named to HBCU Buzz’s Top 30 Under 30 list this year, was modest. This calling has led her to work with various groups on campus. Hill is the director of student relations for Hampton’s Student Government Association. She’s also the chairwoman of community service for first-year pharmacy students, a member of Delta Sigma Theta sorority and founder of Service Spree, the group that won Best Student Organization in the HBCU Awards. 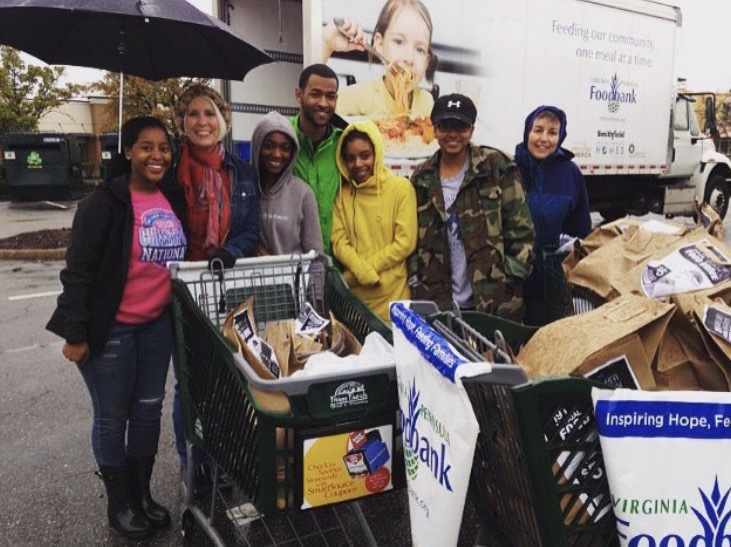 Aria Hall and volunteers at the annual Mayflower Food Drive for Farm Fresh grocery stores in the Hampton Roads, Virginia, area. “It started with about 10 people who signed up to fill spots for one event, then it grew,” said Martha Baye, 21, Hampton SGA’s president and a friend of Hill’s. In four years, Service Spree has blossomed to more than 200 volunteers. They serve at 10 community sites: Virginia Peninsula Food Bank, Good Mojo, Coliseum Nursing Home, First Baptist Church, Veterans Affairs Hospital, Habitat for Humanity, Huntington Middle School, Dunamis Christian Church, Access AIDS Care and Williamsburg Community Garden. Service Spree has enhanced the lives of its volunteers as well. “To actually see the real world outside of my day-to-day college life, people are actually struggling to get by, but you can take a couple hours out of your day to make it a little bit easier for someone else. That to me is the greatest asset I’ve gained from Service Spree: compassion,” said Nathia Thomas, 21, a Hampton student and site director for Service Spree. Service Spree served as a launching pad for other initiatives. Gentelligence is a “big brother” mentoring program for Hampton men and young men at a local middle school. Passionate Purses donates purses stuffed with female necessities to women in shelters. This year, Hill even established a scholarship through Service Spree called Service Spree Across the Seven Seas. It’s for Hampton students who are studying abroad. Hampton was nominated for 11 HBCU Awards and received three. Central State University in Wilberforce, Ohio, won the award for Historically Black College/University of the Year. Best newspaper went to Howard University’s The Hilltop. Tarik Cohen from North Carolina A&T University and Hampton’s Malia Tate de Freitas won for best male and female athlete, respectively.